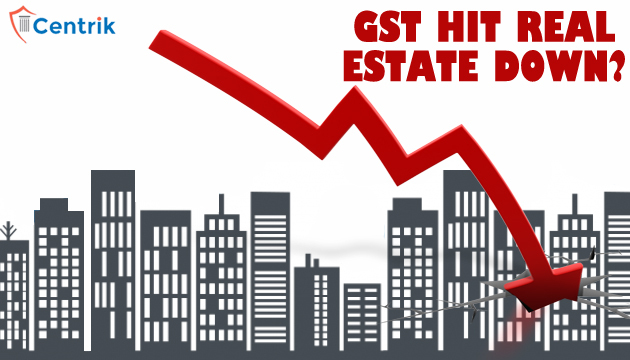 CentrikBlogsTax AdvisoryAll About GSTWill GST Hit Real Estate Down? As GST (Goods and Services Tax) Council still prolongs to meet to fix rates and streamline rollout procedures for the new tax regime, people are still bewildered whether under GST property rates will access or not ? All under construction flats would be charged only at 12 per cent, the land tax of 6 per cent excluded. Meanwhile, all new real estate projects will be taxed at 18 per cent. There has been a marginal increase of 2 per cent for cement, and cut to 5 per cent for coal, limestone, lignite which would bring down construction costs. Labor is no longer an unorganized sector as every worker should be paid wages according to the market rates and an invoice has to be produced. This added with the demonetization drive and Real Estate Regulatory Act (RERA) coming into place, would help eliminate the cash component in the industry. Manufacturing industry can now sell products at a lower rate, which should also help to bring down prices. Nonetheless the biggest mechanic will be introduction of Input Tax Credit, wherein credit of taxes paid at each stage of construction can be claimed by the builder and benefits to be passed on to the consumers. State governments have also been instructed to make approvals quicker to save on time and money. “It’s like basically now the construction technologies can only solve the problem I think. One is overall reduction in the size of the units but then there is the aspiration for more spaces. Also, something on the technology front will reduce the cost of the construction because this is a real way in which we can reduce prices. It is challenging. But we will do everything,” said Secretary to Government, Housing & Urban Department, Tamil Nadu. This comes in the atmosphere of RERA (Real Estate Regulation and Development) whether rates will increase or not. But for the blended effect of GST, the rate card will neither soar nor dip. Although industry will tabulate the actual effect after a month.